First off, we should probably amend the title of today’s post from reading “The joys of taking a woodworking class in New York,” to “the joys of taking a woodworking class” in general. 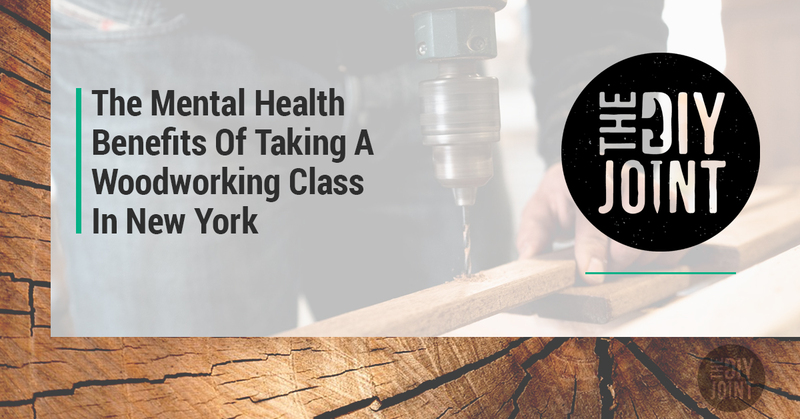 While The DIY Joint is a shared workspace in Hoboken, NJ where anyone can learn woodworking skills to make something awesome, today’s post isn’t only going to concern our NY woodworking classes. Instead, we are excited to cover a topic that applies to anyone who might be interested in learning a new hobby like woodworking; for those of our readers who might be on the fence about branching out and trying something new, we want to take the opportunity to highlight a few of the practical benefits and joys you can expect to experience while learning how to woodwork. But before we get ahead of ourselves, allow us a word or two about what we have to offer at The DIY Joint! The words above were penned by our owner and founder, Priscilla Van Houten, who started The DIY joint out of a desire to give others an exciting, fun, and empowering experience through making something with their hands. We’ve said it before and we’ll say it again; it’s not about what you make, it’s about the satisfaction of making it yourself. That being said, we provide all our woodworking course students with the skills, equipment, and professional-grade tools they need to learn the craft of woodworking in a serious way. With friendly and experienced instructors, we take the guesswork out of learning a new craft. Simply put, when you come to The Joint, be prepared to be empowered and challenged all at once! For the majority of us who have experience woodworking, it’s safe to say that we didn’t begin dabbling with the hobby for its mental (or physical) health benefits. It probably wasn’t that intentional, although we would surmise that the majority of practicing woodworkers would talk about how good the hobby makes them feel — both during the activity itself and while experiencing the satisfaction of completing a project on your own. However cognizant we are, the fact remains that woodworking can be a remarkably beneficial activity from a multitude of perspectives. A Mentally Wholistic Activity – What some call a “whole-brain activity,” woodworking is unique in that it offers those who partake the chance to use distinct parts of the brain. The right side of the brain is generally connected with creativity and emotions while the left is more analytical and rooted in logic. When you measure, use hand-eye coordination, imagine and envision, these hemispheres work in harmony. And aside from that just being plain cool, this kind of holistic brain activity can improve your capacity to handle potentially stress-inducing situations. More generally, this is why the field of art therapy has grown so much in popularity; it’s been used to combat anxiety, stress, depression, and other kinds of mental health issues. Wisdom Of The Hands – The United States’ education system is losing ground when it comes to the math, science, and reading skills of their students when compared with other countries — and international query placed USA students at 25th in math, among 34 countries surveyed, and average in science and reading. And while “being number one” shouldn’t be a crazed priority, there’s something to be said about our youth slipping in this key field. However, an abundance of woodworking teachers think that incorporating a more tactile, hands-on approach, to education could lead to improvements in these fields. With the abandoning of shop classes around the country, it’s led to a generation that lacks the ability to “DIY” — or even perform basic fixes in terms of manual competence. What’s more, not everyone is “book smart” to put it plainly, so letting students learn with their hands is a great way to unlock natural gifts and encourage self-esteem development for a demographic of children who might be less inclined to traditional academic success. All this to say, many are of the opinion that shop programs — which often include woodworking — will lead to myriad benefits which educators should look to glean. A Hobby With No Strings Attached – Nick Offerman has a way with words. He also thinks that woodworking is a hobby that nearly everyone should take up, due to the fact that it’s empowering and can be done independently (once you know what you are doing, we should warrant). “I would advise that you take up woodworking, because it’s addictive,” a “craft that is so satisfying, that doesn’t require the input of any corporate entities. The stress of carving out a life in show business lead him to the cathartic practice of woodworking; Offerman would “Just start sanding a walnut table.” After a while, “I would see the tangible result of this work that I had done. The thing is, there’s no way to describe the sensation. There’s magic in it, whether you’re working with glass or metals or food or knitting or wood.” We agree with Nick, as you might imagine, as many of us have been able to find solace in woodworking. As you can imagine, there are plenty of other joys and benefits we haven’t had time to address, but we think you get the idea! If you are interested in booking a woodworking class at The DIY Joint, browse our class schedule today! We’d love to have you join us.